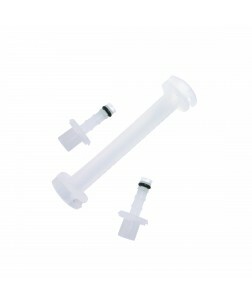 This is a single use cartridge which is suitable for use with MPLC, FPLC™ and ÄKTA design™ chromatography systems. It is sufficient for working with 1 ml of packed bead bed volume. The package contains 5 cartridges of polypropylene (5 cartridges & 10 end plugs) and a polyethylene frit with a nominal pore size of 12 µm. Note: For storage of packed cartridges, Stop plugs need to be ordered separately. Instructions for Cartridge Packing and Use.